British society changed radically in the 21st century. Any political party dedicated to preserving the Britain of 1900 would have faced, over time, either major problems of adjustment or the possibility of its own destruction. The British Conservative party was just such a party, its character defined by its commitment to the defence of the British status quo. Yet it has also been one of the most successful political parties in the twentieth century. Not only was it able to adjust itself to the transformation of British society including two world wars and the most catastrophic slump – but it was able to win elections more consistently than any of its rivals. This book seeks to show how the Conservatives achieved such a metamorphosis, by identifying the main changes in the British economy and society, and the changing Conservative response. In practice, there was no single Conservative response to any particular change. The debate within the party revealed a surprisingly large number of responses; yet the range was limited. Indeed, with some simplification, one can see only two general political positions, from which flowed differing proposals on all detailed issues. In describing these two positions, the author suggests a new method of classifying dominant political beliefs in Britain and other Western countries. This study covers a wide field, bringing together contemporary Conservative politics, economic problems and economic history. The Conservatives were intimately related to the interests of what used to be called British capitalism, and their attitudes to the changes taking place in industry reveal most clearly the changing political priorities of the party. The book examines Conservative policy, proposals and attitudes to nationalization and the public sector, to the trade unions and labour, to private business and finally to the economic role of the State, between 1945 and 1964. 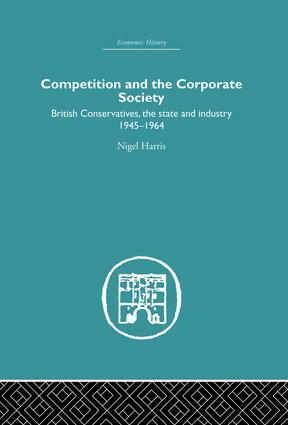 For those wishing to gain an understanding of the British Conservatives, Nigel Harris’ detailed and stimulating material will make excellent reading and has been acclaimed since its first publication in 1972.